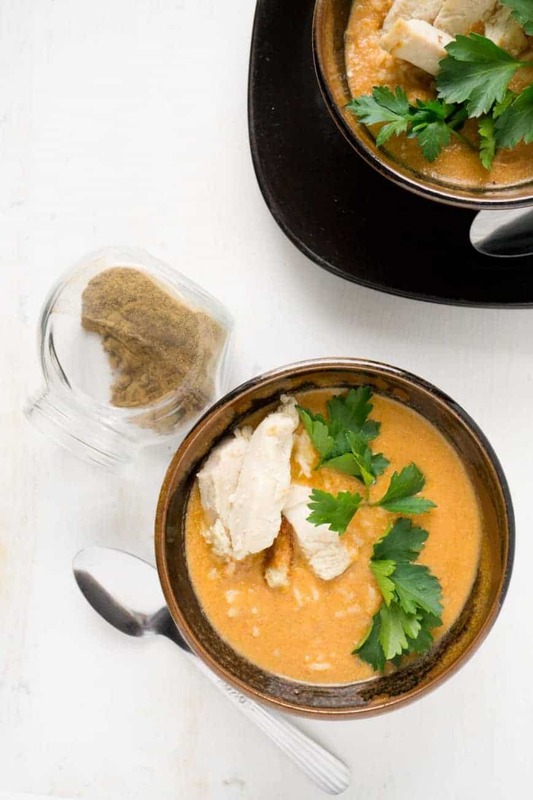 Like this Butter Chicken Soup. I’m surprised it had never occurred to me before to put these two things together! But am I ever glad I did. I can now eat two of my favourite things at the same time: soup and butter chicken. I think my life is complete. Butter chicken is typically made with whipping cream. While extremely delicious, the cream adds a significant amount of calories. 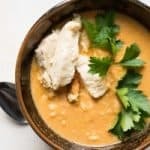 Subbing the cream for evaporated milk and diluting the whole thing into a soup format, this recipe retains all the flavour of butter chicken but ends up being much lighter! This recipe is the perfect thing to make when you have leftover rice… or chicken… but especially if you have both leftover rice AND chicken! 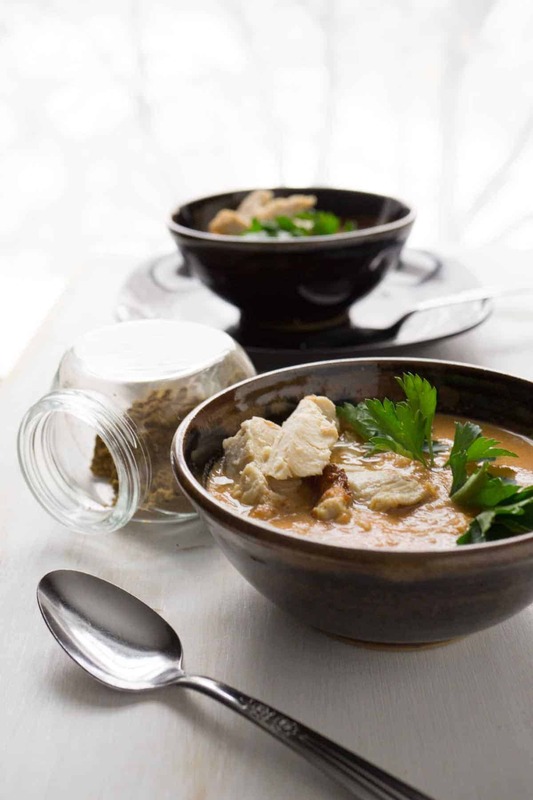 All the flavour of your favourite Indian takeout in a lightened up soup! In a large soup pot, heat the oil over low. 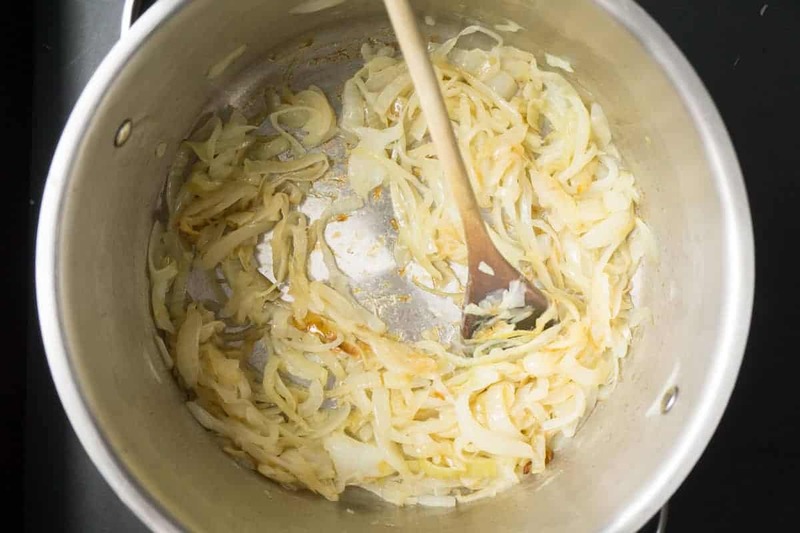 Add the onions and cook, stirring occasionally, until golden brown (see photo). This will take about half an hour. Add in the carrot, celery, garlic, garam masala, paprika, cinnamon, and salt. Cook for 2 minutes. Add the diced tomatoes and chicken broth. Turn heat up to medium. Once soup is simmering, add the evaporated milk and blend until smooth (using either an immersion blender or by transferring to a stand blender). Stir in the cooked rice, cooked chicken, and lemon juice. Alternatively, the broth can be made and frozen. Defrost and add to leftover rice and chicken! Thanks for letting me know I missed that step. It gets added at the same time as the tomatoes. I made a vegetarian version last night with vegan chicken broth and pan-fried paneer in place of the chicken. It was great. Awesome! Thanks for letting me know the crockpot version worked!